A great accent plant for a garden. 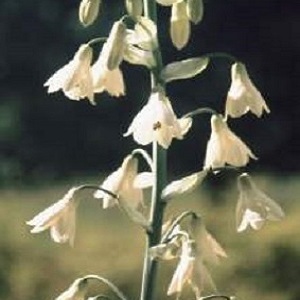 This summer growing bulb has spikes of bell shaped fragrant white flowers in mid to late summer, growing to a height of 1m – 1.5m. It is impressive growing in groups in a border and in pots, looking lovely grown together with Gladioli. It makes a good long lasting cut flower. These plants come from the cool Drakensberg Mountains in Southern Africa. The Cape Hyacinth grows best in full sun and well drained soil, in a sheltered position. The bulbs can be left in the soil in the winter if the soil is well drained and well mulched. In colder parts of the UK the bulbs should be lifted in late autumn and replanted in spring. Pack of 5 bulbs (12cm+). Plant in March and April directly into the ground or into containers. Planting instructions are printed on the packet. Plant bulbs in March and April, 15-20cm deep and 20-30cm apart into unfrozen soil and mulch over to protect the bulbs. Or plant one bulb per 1 litre pot to a depth of 10cm. Bulbs can be left in the ground over winter once planted. Protect fleshy new growth from slugs, snails and rabbits. Cut back finished flowering stalks and more may grow. Clear away dead leaves in autumn. Leave bulbs in the ground over winter where the soil is well drained. Otherwise lift in autumn, store somewhere cool in winter, and replant in spring.